Installing a traditional flight of stairs is usually the most practical, easiest and good looking solution to accessing your new loft conversion. Installing this style of access is usually straight-forward though the building regulations stipulate that the maximum rise and going of the flight should be 220mm with a pitch of 42°. There should also be a clear 2m of headroom though 1.8m can be acceptable and indeed even less can be OK for some loft conversions. 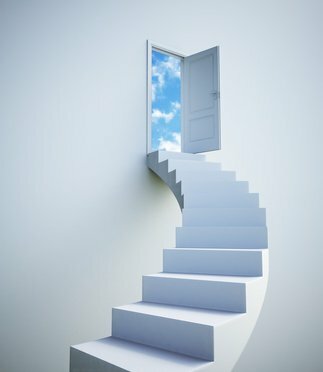 There isn’t any standard width for a traditional staircase into a loft conversion though the stairs need to be wide enough to ensure safe passage in the case of emergency though you should really be looking at a minimum width of 600 - 800mm with 600mm usually being sufficient if there is only one room in the new conversion. A landing will probably need to be provided at both the top and bottom of the staircase with, no surprise here, its width needing to be at least that of the stairs. A door can be installed at the bottom of the staircase providing it leaves a clear space of at least 400mm across the width of the stairs. There are several options here. A traditional staircase with a straight flight is the usual solution but, depending on available space, there are alternatives. A dog-leg, in which the stairs double back on themselves, is a popular choice and can save a lot of space. Equally, there are variations on the dog-leg theme with a small halfway landing being used before the stairs branch off at the required angle. 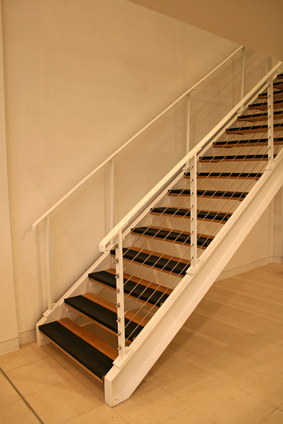 Deciding on the style of staircase to be used may be dependent on the available headroom. If there is insufficient headroom then a dormer may need to be incorporated into the final design of the loft conversion. When considering which style of staircase to install lighting must be taken into consideration. Lighting needs to be included in your plan – both electrical and natural. Switches have to be placed at the top and bottom of any flight of stairs but if you can include a skylight window, either directly above or at the top of the stairwell, the natural sunlight will greatly enhance your loft conversion. The provision of fire safety is vital, not only from a common-sense approach, but also in order to comply with the building regs. There are many safety factors to be considered when planning a loft conversion but staircases are particularly important as they act as a funnel to flames and help them spread in the event of fire. For this reason the building regulations stipulate that staircases should be enclosed by a door, wall or partition which is capable of resisting fire for at least thirty minutes.